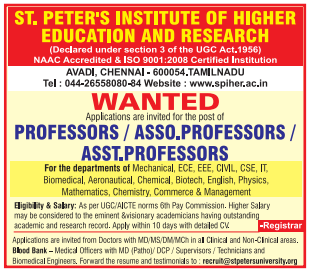 St.Peter’s Institute of Higher Education and Research Recruitment 2019 Professor/Associate Professor/Assistant Professor Jobs Notification,Jobs in St.Peter’s Institute of Higher Education and Research Notification For Professor/Associate Professor/Assistant Professor,Teaching Jobs in Imperial International School. and Eligible candidates can send the Updated Resume, All Educational Certificate copies to Email-d given below. More Details can refer http://spiher.ac.in Official Website. Required details like Salary, Qualification, and Application Procedure are given below. St.Peter’s Institute of Higher Education and Research. Eligible applicants send the Updated Resume, All Educational Certificate copies to Email-d or college Address are given below.